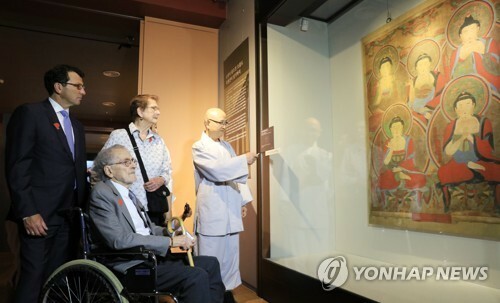 A South Korean temple on Friday opened an 18th-century Korean Buddhist painting, stolen about 50 years ago, to the general public after its American owner and a US art museum let it be repatriated to South Korea last year. The painting, called "Obuldo" in Korean, a depiction of the Five Buddhas, was stolen from Songgwang Temple in Suncheon, 415 kilometers southwest of Seoul, in the early 1970s. Obuldo, made by Uigyeom, a Buddhist monk and painter in the 1392-1910 Joseon Dynasty, was one painting in a series of 53 Buddhas in 1725. It was transported to the South Korean temple in December after it was brought back to South Korea from the Portland Museum of Art in the United States. American citizen Robert Mattielli, who lived as an artist and teacher in Seoul for three decades starting in the 1960s, bought the roughly folded Buddhist painting for just $10 at an antique shop in Seoul and had the damaged painting flattened, cleaned and framed in the early 1970s. He and his wife Sandra later moved back to Oregon in 1985 with the artwork. The two, advocates for Korean art, decided to donate the work to the Portland Art Museum in 2014, when a team from the Korean National Research Institute for Cultural Heritage was conducting a survey of the US museum's Korean collections to publish a bilingual catalog, according to the Korean Cultural Heritage Administration. Several months later, the team reported to the museum that the Buddhist painting was stolen from Songgwang Temple sometime in the early 1970s. Upon hearing the news, the couple offered to repatriate the painting to South Korea without conditions. Mattielli, his wife Sandra, and Portland Art Museum Director and Chief Curator Brian Ferriso attended Friday's exhibition on the painting and other remaining paintings of the 53 Buddha series. Mattielli, in a wheelchair, said he is pleased that Obuldo had returned to its own home and is on display with other paintings, thanking the temple for taking good care of it.